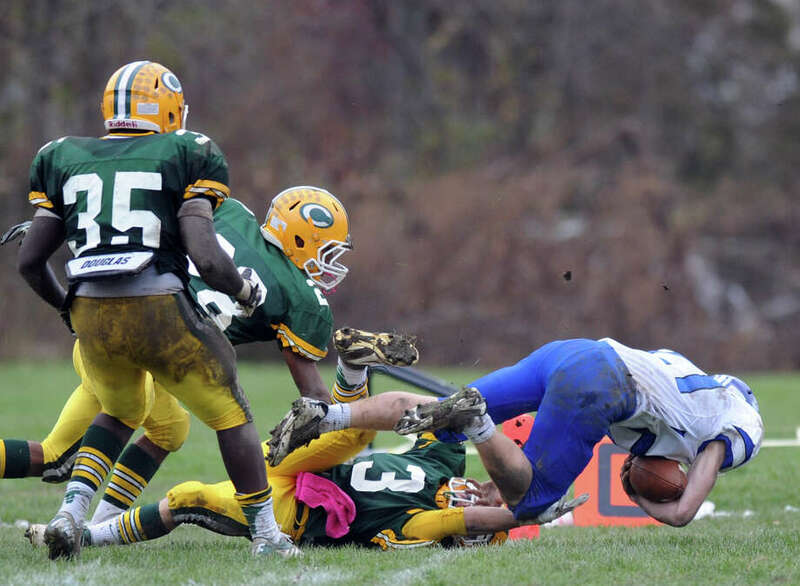 Darien's Nicholas Lombardo makes a catch and dives into the end zone for a tie-breaking touchdown during Saturday's football game at Trinity Catholic High School on November 10, 2012. STAMFORD -- The Trinity Catholic and Darien football teams entered Saturday afternoon's critical FCIAC showdown in a circumstance of role reversal, cast in different parts from what was expected before the season started. And it was that adaptation that led Blue Wave coach Rob Trifone to a decision he likely would not have otherwise made, one that produced one of the most dramatic finishes of the year and had a domino effect on the league playoff picture. Nick Lombardo out-leaped two Trinity defenders and came down with a 35-yard pass from Henry Baldwin with seven seconds remaining, lifting the Blue Wave to a 26-20 win at Alumni Field. The victory was the first step in Darien salvaging a season that had veered off track, while dealing a blow to the Crusaders, who came in with the chance to play Thursday night for a shot at sharing the FCIAC championship. "I had a wheel route and I looked back and saw the ball in the air and tried to make a play on it," Lombardo said. "I knew I had to get the ball, that it was mine, and I took it." Darien, considered a preseason contender, came into the day 4-3 and looking to play the role of spoiler, a position the Crusaders have found themselves in during recent seasons. What began as a defensive struggle turned into a frenetic climax, starting with a rare mistake by Peter Gesualdi, whose absence to injury for much of the first half of the season was a reason for Darien's slow start, and whose versatile overall efforts set up the final heroics. Gesualdi muffed a punt that was recovered by Trinity on the Blue Wave's 28 with 1:03 remaining. But on 4th down, looking to set up John Benalcazar for a game-winning field goal attempt, Darien's Mark Evanchick sacked Danny O'Leary for a 10-yard loss at the Crusaders' 33 with 26 seconds left. "That's our freshman," Trifone said of Evanchick. "He has played spottily because he's a freshman. I actually hugged his dad at the end of the game." Tom O'Neil, the Blue Wave's offensive coordinator, suggested to Trifone that the team take a knee and go to overtime, a strategy he likely would have been amenable to if the season had played out as hoped. "I said no, let's take a shot down the field and let's try and get in field goal range," Trifone said. A 32-yard pass to Gesuladi, wide open on the right side, set up Baldwin and Lombardo to share the spotlight. "Nick Lombardo made a tremendous play," Trifone said. "He was triple covered. I don't how he did it, I'll have to watch the film. In some respects, if we were 7-0 I might have taken a knee there and go into overtime. If you are 4-3 and had a tough year as it is, take a shot." Trinity (7-1), which held a 7-6 halftime advantage, twice gave up leads in the second half. It retook one at 13-12 on the final play of the third quarter, Danny O'Leary's 63-yard pass to Neno Merritt. After Baldwin's pass to James Bennett and a two-point conversion put Darien up, 20-13, Shaquan Howsie's second touchdown tied the score at 20-20 with 3:43 left. Despite scoring twice, Howsie was held in check by the Blue Wave, rushing for just 38 yards on 20 carries. Of the play that cost his team a chance at the FCIAC title, Crusaders coach Pete Stokes said, "I saw Shawn Crowell in good position and I saw Randy Polonia getting over the top. I saw we had more than they had and I saw their kid going into the end zone. I was upset we didn't get our chance but they sat on a screen." The Crusaders still control their fate for a berth in the CIAC Class S Tournament. They finish the season with games against St. Joseph and Wilton. "We have to come together," Stokes said. "I still think things are going to go our way. I don't think we got beat. They made a play. That was a good football game." Records: Darien 5-3; Trinity Catholic 7-1.